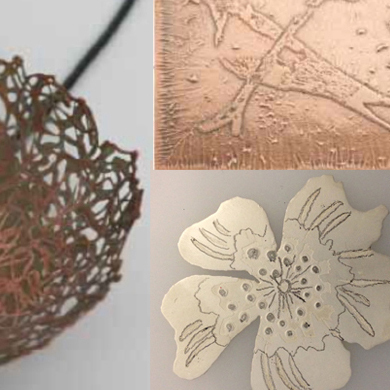 Etching Techniques for Jewellery: Weekend Course. – On this course we introduce you to a range of etching techniques for jewellery and their application, especially in relation to pattern-making and texturing. We will discuss the pros and cons of various mordants and resists, and the associated health and safety issues relating to their usage. As well as exploring traditional mordant / resist applications used in etching (Acids to dissolve the metal, varnishes, stencils, tapes to stop out the surface), we will also experiment with a form of photo etching which allows for the transfer of a photographic image to act as a resist for stopping out acid erosion of the metal surface. We’ll cover electro etching too – a relatively safe method for etching non precious metals at home..
On the second day you may wish to concentrate on producing a finished piece of jewellery such as a bangle or pendant. Alternatively you may wish to concentrate on producing as many exploratory samples as possible in the time given. The course fee covers the cost of all materials. Metals available for your use include brass, copper and gilding metal. You may also bring your own precious materials to work with. Can I get my work hallmarked? We are able to offer a hallmarking service for precious jewellery made at Flux. So if you would like to have your work hallmarked with the Flux Studios hallmark this can be arranged at cost price. We’ll provide you with tea, coffee and light refreshments throughout the weekend. You’ll need to bring some lunch.